Today we stop to honor the many men and women who have chosen to serve America on the frontlines. And we stop to pray, not only for the soldiers, but for their families. Especially now, as the holidays near, and their absence will be so deeply and painfully felt. So today … to honor those that serve, I want to pause to remember to be thankful for what I have. I stop to take a moment to recognize the unsung hero in my own little war zone – my husband – also known as “dad.” He is the hero to three sets of adoring eyes, three sets of sticky and grimy hands, three sets of legs that tackle and beg to play before he has even had a chance to change out of his work clothes. I stop to contemplate the frequent barricades of unwashed dishes, unfolded laundry, unmade dinners, undone kids (and at times wife!) … and remember in my heart the courage of this man who still comes faithfully and cheerily home, night after night. I stop to pray for this man, who has held my hand through trials and losses, and has shielded my heart with his words of faith and acts of loyalty, even when he himself has been left a little battle-scarred. I pray for this soldier who has stood firm to love me, our three ever-growing bundles, with Christ-like grace – in a world that constantly pulls soldiers astray. Today, I salute heroes far and wide. Those who sacrifice to stand in the unthinkable with courage beyond words, you touch all of our lives. 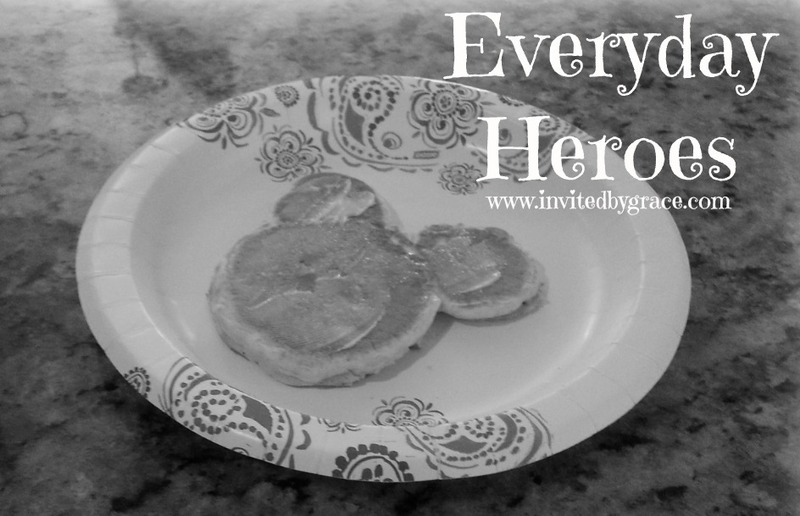 Do you have an everyday hero in your life? How so? Please share! An absolutely lovely tribute! My guess is that your husband feels like a lucky man or he would not come cheerfully home each night! My husband and my step father are two of my everyday heroes. Great men in my life for sure! Thanks for a lovely post…again! Aw thanks … your husband and step dad must be some great men. They are lucky to have you too I am sure! God knows who to bring to us! And you are on a roll there my friend! So many great thoughts and posts coming from you! I am enjoying it. And always rooting for you, praying your days get easier. This is so wonderful, Kim. I love how you changed gears and talked about your husband’s absolutely beautiful. You are so right, sometimes the messes and the emotions and the uproar is similar to a battle scene. And even more, I feel like a true hero these days is a man who faithfully comes home every night, despite all of it. In fact, it seems these soldier of integrity look forward to it. How blessed we are to have such committed sweethearts. ☺ Love this post! We are blessed Marla. 🙂 I do forget this at times in the craziness and busyness that is parenting. I agree you don’t only have to go off to war to be a hero. Just coming faithfully home is also heroic. Especially in these times when that is not always a given. So sweet, Kim! What a great example to set for your kids that you respect, love, and honor your husband in the everyday moments. We sometimes take that for granted and this was a lovely reminder not to. Thank you Tiffany. I must say, I write this to remind myself too! I like that .. love and honor your husband in everyday moments. That really is the heart of what I was trying to say. When I take the time to see how I am blessed with a husband who loves me, it does put a lot of things in perspective. Marriage is a gift that I know I can take for granted, especially after so many years. But, I know it honors God when I honor my husband … and so it is something I continue to strive for! (Though imperfectly at times!). Love this tribute. Beautifully stated. Thank you so much Abby! I appreciate you stopping by! And I have been enjoying your posts! Such a heartfelt and beautiful tribute Kim.